Six gold medals and two days of solid performances propelled the Chamblee Lady Bulldogs to the Region 6-4A girls’ track title 146-129.50 over defending champion Marist at Lakewood Stadium in Atlanta. Elena Brown-Soler kick started the Lady Bulldogs on the first day of competition picked up gold medal victories in the high jump (5-06.00) and the long jump (18-08.50) ahead of runner-up Rachel Edler (18-00.25). Edler grabbed gold in the triple jump (37-01.50) with teammate Khiara White taking the silver (36-10.00) as the Lady Bulldogs piled up points on the first day to lead Marist 61-45.50. Fourth place finishes by Sydney Holes in the pole vault (8-00.00) and Oni Tunson in the shot put (32-03.50) and discus (92-07.00) contributed to the 61 point total. All five participants advance to the State Sectionals at Eagles Landing High School on Saturday, April 30. The Lady Bulldogs opened up the track finals on Thursday with the relay team of Venida Fagan, Sydney Holmes, Elena Brown-Soler and Jasmine Radford making a statement by running a time of 47.84 to win the 4×100 meter relay. Fagan followed up by taking the gold in the 400 meter dash (55.13) and a silver in the 200 meter dash (24.92). Radford took silver in the 100 meter dash (12.40). Brown-Soler took bronze in the 100 meter hurdles (15.44) and Xiao Beining grabbed bronze in the 3200 meter run (11:58.55). Chamblee closed out the girls’ competition as Holmes, Edler, Fagan and Brown-Soler took gold in the 4×400 meter relay (3:56.96). Destinee Rocker won the 100 meter hurdles (14.31) and finished fourth in the 300 meter hurdles (49.98) to lead the Arabia Mountain Lady Rams to a fourth place finish (72) in the team standings. 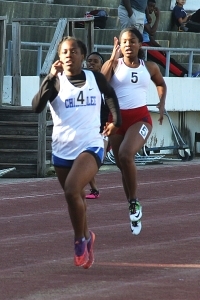 Alexandria Andrews clocked a 12.26 in the 100 meter dash to aid Columbia’s fifth place finish (68). 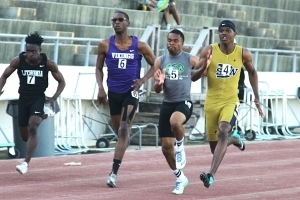 The Arabia Mountain Rams made one of their best region performances in the history of the program by finishing just 9.5 points behind Grady (133) to pick up the runner-up slot in the boys’ meet with 123.50 points. Three Rams picked up one gold and one silver medal each during the two days of competition and a fourth took home a gold and a bronze. Tyler Jones came up strong on the first day in the field events as he won gold in the triple jump (45-06.00) and silver in the long jump (22-03.00). Michael Willingham threw for gold in the discus (153-11.00) and a bronze in the shot put (44-07.00) as the Rams put up a solid 44.50 points to get into third place heading into the final day of competition. The Rams opened the second day of the meet by taking the gold in the 4×100 meter relay as Desmond Rocker, Travian Hall, Priest Foust and Berhane Johnson ran a time of 41.59. Quincey Wilson followed with a gold medal in the 400 meter dash (48.49) and later added a silver in the 300 meter hurdles (39.20). Priest Foust added a gold in the 100 meter dash (10.95) and a silver in the 200 meter dash (21.99). Chamblee’s fifth place finish with 65 points was fueled by gold medals by Will West in the pole vault (11-06.00) and Jordan Muse in the shot put (46-01.25). West also contributed a silver medal performances in the 110 meter hurdles (15.81).